That's actually a pretty clever design, and I learned a long time ago that for knives I am going to be beating the crap out of, cheap steel is usually better. It seems like for me NOTHING holds an edge (except ceramic, which never seems as sharp as a well sharpened steel blade for some reason, plus ceramic shatters too easily), so ease of resharpening is key. Easy resharpening = cheap steel. 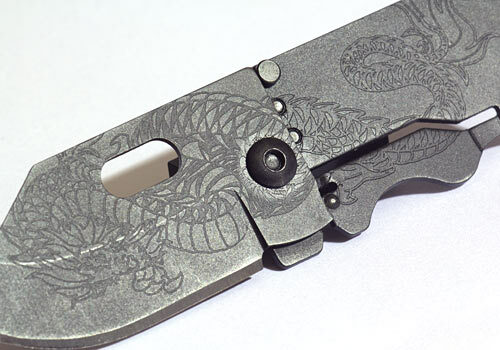 However I have also found that ease of opening and use is better than small size, so I carry a SOG Aegis with the idiotic blade lock disabled with a dab of epoxy. In black TiNi - go figure. All of the "Columbia" knives have that same little print. If they could make them red, white and blue for a tenth of a cent, they would. 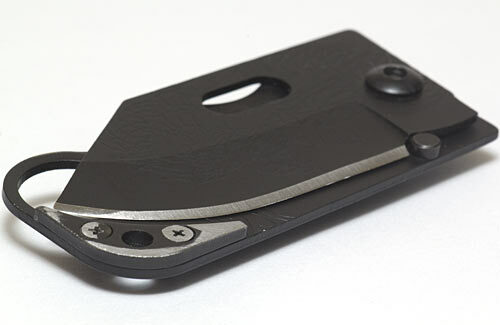 reminds me of the SOG Access Card 2.0, a little thicker for a lot less $$. Didn't even know about that one - I am attempting to develop a protective selective blindness regarding expensive toys :-). 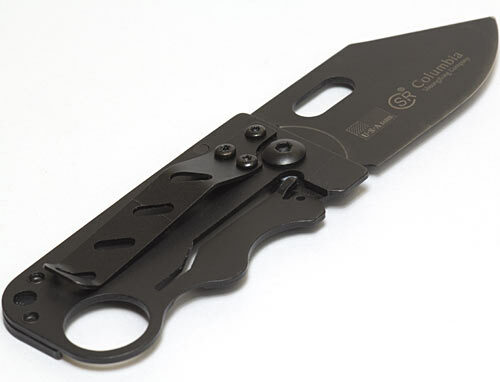 The SOG lists for $US90 or something, but you can get it for under $US50 ex delivery. 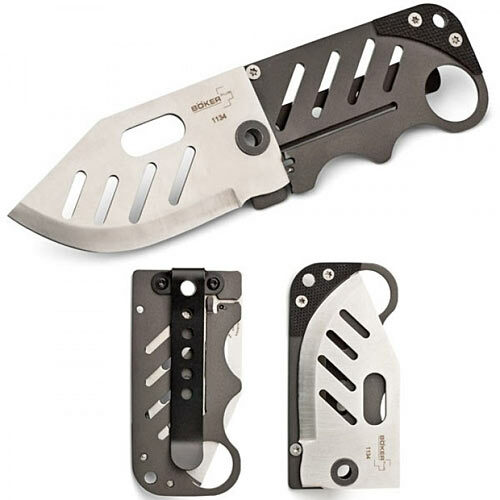 It's got another finger-worth of handle length, and a less stunted blade, so would clearly be more usable than the smaller Boker or this knockoff. But the whole idea of this thing's pattern, if you're not climbing mountains or being shot into space and thus watching every gram of weight, is it's a standby knife that you don't use all the time. Nor would you want to - you just can't get around the uncomfortability of the super-narrow handle. 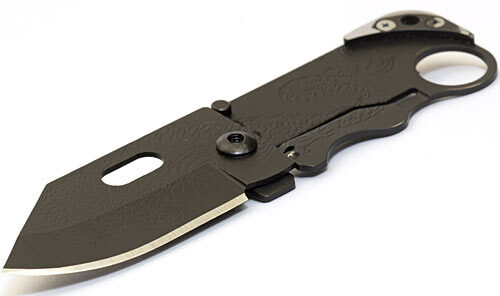 Much better to spend your five to ten bucks on a Chinese knockoff of a "proper" folding knife. 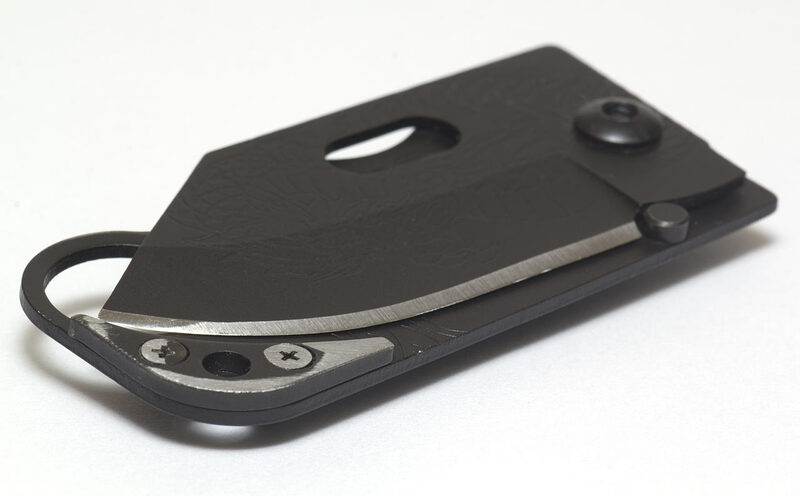 I love my 10-ish-years-old KISS knife, such a useful thing to carry in the zippo pocket (or as a bill-fold). You have to accept that if you don't pay attention you might slice your fingers trying to use the screwdriver but it's so damn useful. It's also so unobtrusive that I managed to fly to the US from London with it accidentally still on my keyring and the TSA didn't notice.. The Swiss-Tech "micro" plier tools are good, too, and you can get allegedly-genuine ones for under $US10 delivered on eBay. They lock positively onto a keyring, they're just big enough to be used without agony, and the all-important hinge pins on their legs seem to be very strong, too, so you can bear down on something with surprising force without wrecking the tool. Again, they're not meant for everyday use, but they do actually work. 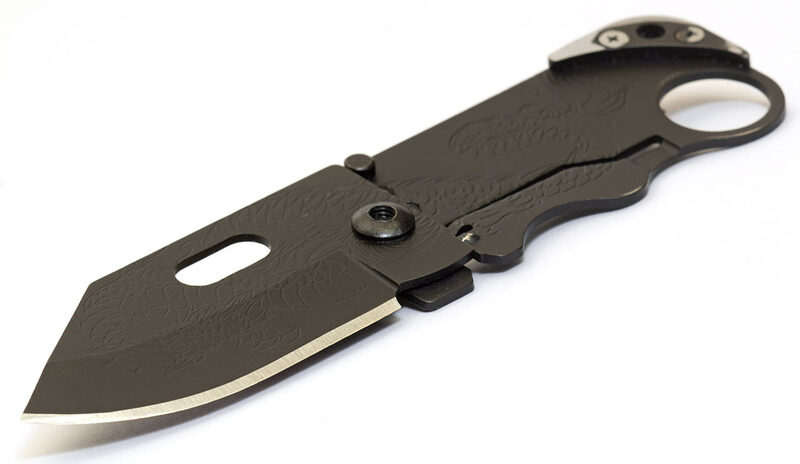 The low-angle photo of the knife had me thinking; "Why is Dan raving about a knife that has a DIE-CAST blade and frame? I wouldn't trust a knife like that to cut processed cheese slices let alone anything like balsa. Look at the horrid die-casting swirls!" Later I saw the dragon embossing - yes, it is now cool. It could only be cooler if the dragon was playing a guitar.